It is proposed that a specialized molten-salt reactor facility for burning long-lived actinides be located in direct proximity to a pilot-demonstration center. A full-scale ZhSR-S with thermal power 2400 MW will make it possible to burn all transuranium elements released during the reprocessing of spent VVER-1000 nuclear fuel and part of the regenerated plutonium and in the process produce 1 GW of electricity and radioisotope products. 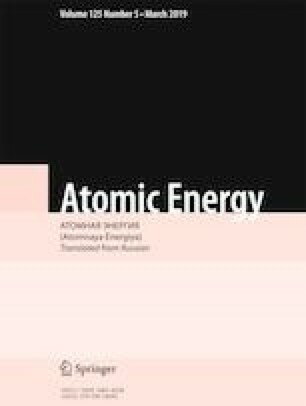 The inclusion of a specialized reactor facility for burning transuranium elements from the spent nuclear fuel of VVER-1000 reactors into the nuclear energy system as an integral element will make it possible to solve the problem of closing the nuclear fuel cycle for actinides and reduce the volume and lower the cost of the long-term storage and subsequent disposal of high-level wastes produced in reprocessing. Translated from Atomnaya Énergiya, Vol. 125, No. 5, pp. 251–255, November, 2018.